24 to 27.99 square inch custom die cut magnets - outdoor & car magnets 30 MIL are versatile promotional gifts that will drive your campaign all over the town and bring you great exposure. You can take advantage of traffic blocks, crowded streets and parking lots to promote your business. These outdoor safe car magnets will serve your purpose. Logo printed die cut magnets can be conceptualized in any shape of your choice. We offer complimentary full color printing on all purchases. 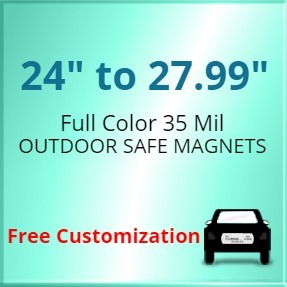 Order any of our promotional magnets today at guaranteed low prices! Request a quote to know what you may save on bulk orders of 24 to 27.99 square inch promotional die cut magnets - outdoor & car magnets 30 MIL.